Last year, we decided to try something new and created a Christmas Family Night. We wanted to create an event that encouraged families to come together, have fun, and meet other families in our church and community. It was a great success, so we decided to bring it back again this year with a new theme and several additions/improvements. We require families to pay and register for this event online. This helps a ton with planning. If you don’t know who’s coming, you’ll end up either over-buying or under-buying, and neither of those is a good thing. We charged our families a flat fee of $15 per family to make it affordable for families of all sizes. We raised the price to $25 for late registration, and most people ended up paying the late cost anyway. We also added an incentive to get families to invite others who don’t attend the church. We allowed all guest families to attend for free. Everyone seemed to think it was a fair price and we ended up having more than triple the attendance over last year. Our theme for this year was based on the movie Elf. Almost everyone loves the movie and kids and adults lit up when they heard about the theme. It was almost overwhelming how many great ideas you can find for Elf-themed decor and party ideas. I decided to keep the photo booth simple. I used mostly things I already had on hand to create the backdrop so I could splurge to buy this Elf cardboard standup. Families loved taking pictures with Buddy and trying to recreate his pose. The back-drop is two pieces of 3/4″, 4×8′ insulation foam board I had previously purchased at Lowe’s. It’s the foam board that is white and covered in a silver coating. We removed the silver coating carefully so the foam board would be all white. We taped the two pieces of foam together with duct tape. Next, we covered the combined pieces with two long strips of blue Kraft paper. I already had a roll on hand (I usually have every color of the rainbow because it’s so versatile), but you can purchase a roll here. If you are careful, you will only need two strips to cover the whole thing with the paper. We found some cute white foam snowflakes in the attic and we attached them at random to the top three quarters of the back-drop with hot glue. Be careful! Speaking from experience, you don’t want to end up with blisters from the hot glue on the palm of your hand. If you don’t already have these on hand, you can probably find something similar at a dollar store or craft store, or you could even cut out your own snowflakes out of paper for free. We covered the bottom of the backdrop with thin fake snow we found at the Dollar Tree. I love how our banner turned out too! Each letter is an individual sheet of 8×11 cardstock. No cutting required! I used this font to create the letters, printed them out, hole-punched the top of each letter, and strung the letters together using some red and white striped twine I had purchased from the Dollar Tree. If you can’t find the twine there, this twine is a great alternative. We were able to create the entire photo booth in just a couple hours on the day of the event! It was a huge hit! Photo booth props were super simple. We ended up using what we had on hand from previous years. You can pick up cute Christmas hats/head bands (including elf options) at the Dollar Tree or Walmart. We also had some other elf-themed photo booth props leftover from last year. Use what you have and it will be great! You could also add some DIY elf hats or create your own elf quotes on a stick. Our table decorations actually ended up taking an entire day for two of us to make, but I believe they were well worth the extra time. We used the Christmas tree decorations from last year’s tables to create Elf hats for the center of each table. If you don’t already have something on hand you can cover, a foam cone would work great for this. We bought three yards of green felt to cover the hats with, and used small sheets of yellow and red felt to cut out the small strips and feathers. It is tedious work if you have to create a lot of them. We made 13 hats in total, and only ended up spending $8 since we already had the Christmas trees. We attached everything using hot glue. It will take a little time to find a technique that works. We ended up hot-gluing the felt on the side and just stuffing the excess felt inside the Christmas trees since they were hollow. We also made a “figure out your elf name” sheet for each table and provided name tags and sharpies for people to wear their elf names proudly all night. The families really loved this activity and there were a lot of laughs. I can’t share the printable we created since we used the picture of Elf, but we created it based off of this printable. We included a Christmas mug filled with crayons on each table for the kids. This year we decided to expand our Ugly Sweater Contest into a full out Christmas costume contest! The three categories used for competition were Most Spirited Family, Ugliest Christmas Sweater, and Most Creative Outfit. We set up a voting table where everyone could go and vote for their favorite person or family. We created printable cards for people to fill out using Canva. To make the table extra special, we bought an ugly sweater from the thrift store and covered the voting box with the sweater leaving the neck opening as the place to put your votes in the box. We purchased some hilarious ugly sweater trophies from Oriental Trading last year to give to the winners and still had some left to use this year. They come with stickers you can put on them with different categories to choose from. They have already discontinued them on their website, but you could use these trophies instead, and it would be just as funny. We also purchased some fuzzy hot cocoa ornaments we found at Target for each of the winners to take home and put on their tree, or re-gift at their next Christmas party. We allowed people to vote most of the night, and tallied the votes up at the end of the night. Our award ceremony was the grand finale at the end of the evening. Food is basically my favorite thing in the world, and I was so excited to be able to create some elf-themed food and drink options for this event. We set up two 8-foot tables adjacent to each other in the front of the room with all the yummy food and drinks. I baked five different types of festive cookies for the food table. All the food was nut-free and at least one of the cookie recipes was also egg-free for the kids who have egg allergies. We also had Chex mix for the salty folks and I made some homemade kettle corn for those with gluten and dairy allergies to enjoy. My favorite items on the food table were the themed ones! We created printables using Canva for each of these items. We created the “candy cane forest” using tree snack cakes with red and white striped sticks inserted into them to create cake pops. We also filled a small glass jar with gum drops to go along with this quote. We purchased these darling jars filled with peppermint sticks for the table. Just a tip, you may want to purchase your Christmas candy corn online ahead of time. I looked everywhere and finally found it at Winco. If you don’t have a Winco in your area, definitely consider purchasing it online. Everyone got a kick out of the coffee display we labeled as “World’s best cup of coffee”. We also set up a hot cocoa bar for the kids and the “big kids”. We set the hot cocoa bar up with all the toppings in cute Christmas buckets we bought last year from the Target dollar section. This year, we simplified the toppings down to marshmallows, peppermint sticks, chocolate chips, and caramel bits. We kept all of the activities and games casual and flexible to encourage families interacting with each other and other families. 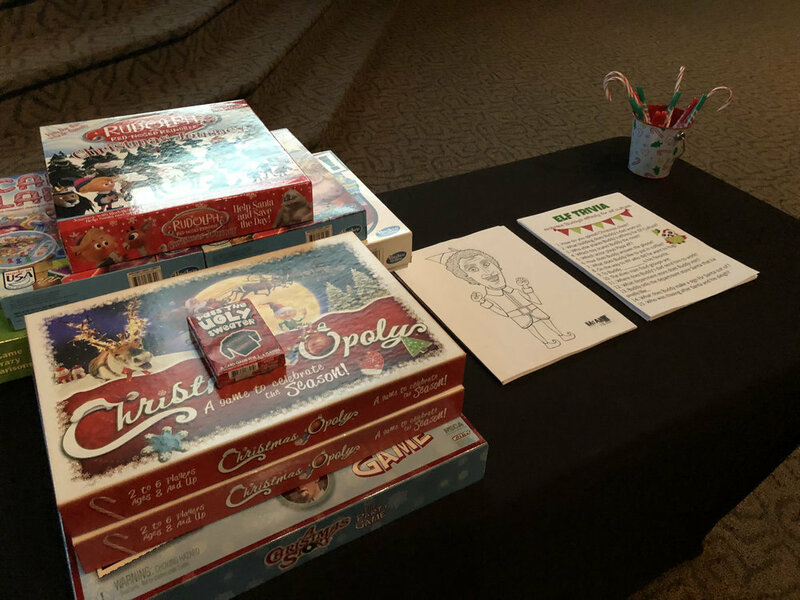 We set up a game table at the front of the room with Christmas board and card games, some regular board games, elf coloring sheets, and elf trivia sheets. Families could use the games and coloring sheets at any time during the event. We found some a Christmas version of monopoly at Walgreens last year for only $15 as well as a couple other Christmas games and an ugly Christmas sweater card game on Amazon. It was so fun to see families playing the games together at their tables, and groups of kids around the room playing board games on the floor together. Last year, I had the bright idea of doing a DIY version of gingerbread houses for each of the families, and it was a crazy amount of work. There was no way I was creating that many houses with how many families registered this year so we went with the traditional Christmas cookie decorating. I made them myself so we could have lots of fun Christmas shapes (including an elf, of course). We allowed every kid and adult to pick one cookie to get started and gave out extras after everyone had gotten one. I came up with the most genius idea after years of headaches over trying to spread frosting and sprinkles out in a crowd. We purchased two-ounce clear containers with lids at Walmart and put frosting and sprinkles in the containers ahead of time. You can also purchase similar containers in bulk on Amazon. We were able to make about six frosting cups out of a normal frosting container and 3-4 cups of sprinkles from one container of sprinkles. We purchased frosting in red, green and white and lots of Christmas sprinkles. Each table got a container of every color of frosting and at least four cups of a variety of sprinkles for decorating. Family feud was so popular last year that we decided to bring it back again! We tried to make it as close to the real show as possible while also getting a lot of the families involved. We didn’t have a good buzzer option so we adapted that part of the game a bit. We brought one person from each family up to the front, gave the question, and each of them had a giant dice to roll. Whoever rolled the highest on their dice got a chance to answer first. If they guessed the top answer on the board they got to choose if their family would pass or play. If they did not guess the top answer, it went to the other family. We decided to play individual rounds so at least ten families would get a chance to play. We played five individual rounds and gave prizes to the winning family of each round. Prizes included board games and Christmas movies. These are some great Christmas questions and results provided by Bryan Phelps. You can also just google Christmas family feud questions and find some good ones. I created my own poll on one of the kid’s ministry Facebook pages about Elf quotes and it was super fun seeing people’s answers. I believe this is officially a Christmas tradition. We created a Family Feud presentation in ProPresenter. You’ll need to understand how props work in ProPresenter in order to use this. There is currently no way to export or export Props in ProPresenter, so you’ll have to create your own. If you import the presentation we used, you’ll see we have the game board for each question along with the correct number of answers available for selection. My husband, Sean created the game board and the materials he used are available here. He also created a video tutorial explaining how he used props and what he did to get the desired effect. I was excited to add a “Jesus moment” to our event this year. I wanted it to be a fun and light version with lots of great Elf video clips. I created a message called “Joy No Matter What” based on the three elf rules from the beginning of the movie. There’s room for everyone on the nice list. Everyone loved it and it was a lot of fun putting it together. If you are interested, you can check out my full message here. Here is my Planning Center Schedule so you can see how the night flowed for us. If you are looking for even more Elf-themed ideas, you can check out my Pinterest board for the event here. Are you planning any awesome family events for your ministry in 2018? I would love to hear how you are effectively reaching the families in your church.